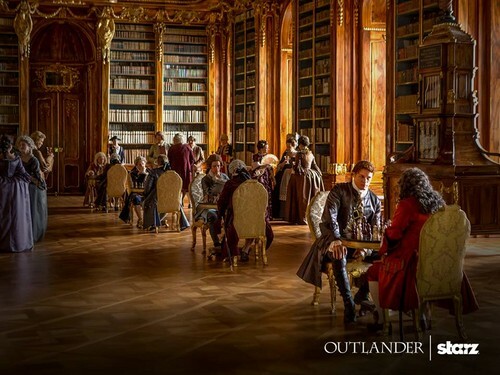 Outlander Season 2 First Look. . HD Wallpaper and background images in the Outlander 2014 TV Series club tagged: photo outlander season 2 first look jamie. This Outlander 2014 TV Series photo contains ریڈنگ روم and پڑھنے کا کمرہ. There might also be بھورا پتھر, اسکول, سچولہووسی, سٹریٹ, شہر منظر, شہری ماحول, گلی, شہر ديکھا, and شہری سیٹنگ.